Since its launch six months ago, the Climate Mayors EV Purchasing Collaborative has been hard at work with cities and counties across the United States to support the electrification of public fleets. So far in support of the Collaborative, 43 cities and five counties have committed to procuring a total of 953 light-duty EVs by 2020, thereby helping to reduce U.S. dependence on foreign oil, diversify our nations’ fuel supply and avoiding an estimated 4400 metric tons of greenhouse-gas emissions each year. The Collaborative is a partnership among the Electrification Coalition (electrification lead), Climate Mayors (city liaison), and Sourcewell (procurement partner). The Collaborative provides a suite of resources and services to help local governments achieve their vehicle electrification targets. The program offers a pricing platform to facilitate the procurement process, a financing mechanism to monetize the federal tax credit through vehicle leasing, policy guidance on EV-charging deployment, best practices, vehicle/fleet analysis, peer-to-peer learning opportunities, and direct staff support. 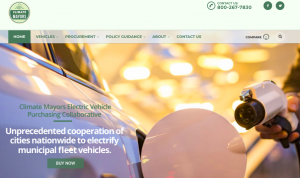 The Collaborative’s website is designed to streamline and simplify the procurement process, allowing local governments to purchase EVs and EV chargers outright, and to capture the value of the federal EV tax credit through a leasing model. 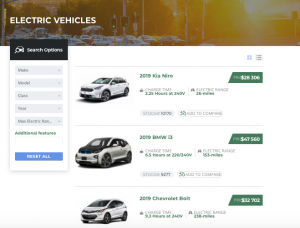 Notably, cities and counties may still utilize the Collaborative’s resources if they choose not to procure EVs via the site’s pricing platform. The City of Ann Arbor – among several other U.S. cities and counties – recently solidified its status as a member of the Collaborative. As Ann Arbor sets its sights on a more vigorous EV deployment, it seeks to learn from and replicate successes from other jurisdictions, particularly with respect to the development of a municipal EV-readiness ordinance. The Collaborative was able to draw from its “brain trust” of EV professionals from other U.S. cities to share expertise with Ann Arbor’s EV workgroup, and to inform the development of Ann Arbor’s policies. The Collaborative’s broader goal is to support and advance the ecosystem for transportation electrification, and to document EV procurement by cities and counties to celebrate local leadership. Visit the Collaborative’s website to find out how the Collaborative’s member cities and counties are leading the way on EVs and helping to transform the U.S. market.